This is what can be fun about the shift in the way books come to market. 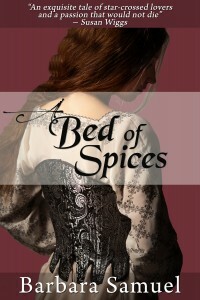 A Bed of Spices was my first historical. It’s a dark, wildly romantic Romeo and Juliet tale, and I loved it madly. It was, however, set in an unusual location, and it did not sell all that well. Over time, readers discovered it and bought the used edition to a point that I saw copies for sale for really enormous amounts of money. Today it’s in the top 20 historical romances at Kindle. What makes that thrilling is that a book I adored and worked so very hard on can now find a new readership in a different market than the one in which it appeared. It is the nature of the Kindle rankings that things move very fast, so likely it will not stay there long. You never know, though, do you? If you’re so inclined, post a review. Let’s see what happens. So happy for you! It’s a great book, and remains one of my favorite historical romances. Bought it on Feb 4, woot! 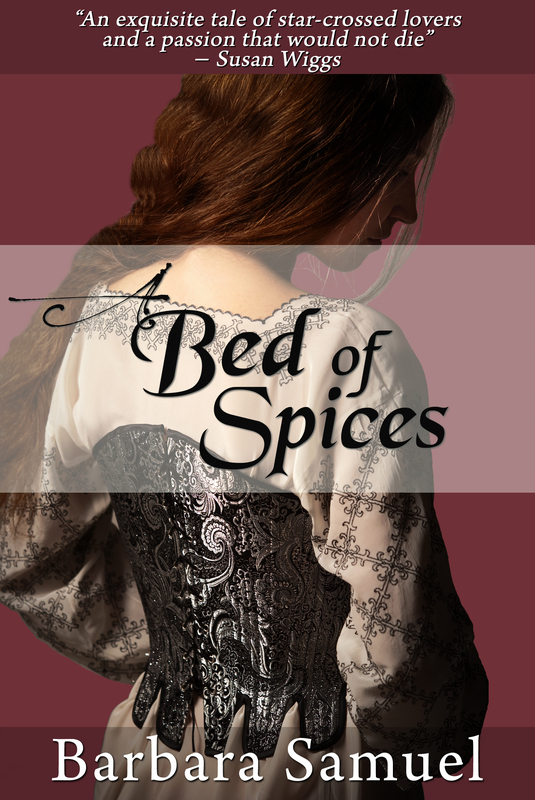 I *love* Bed of Spices. It’s trademark Samuel – all the sensory texture I adore about your books – plus the wonderfully unusual time period and setting. Julie, thanks for giving it a try. I do write in a number of arenas that might not always be what people like/expect, but exploring can be expansive. I found this book recommended on a site for kindle users. What a gift. It was just the perfect read for me right now – it filled my imagination and took me away. I’ve since purchased and am reading all the rest of your historical novels I’ve found on Amazon. I feel sad that the medieval romances didn’t sell well when they were in print – it’s my favorite time period. I loved the ‘new’ setting in A Bed of Spices! It’s a breath of fresh air from all the stuff set in Britain/Scotland/Ireland etc. Anyway. I just wanted to say ‘thank you’. All your hard work writing an amazing story is very much appreciated! Lori, how wonderful! See, that’s why I’m doing this…to find readers like you who share some of my tastes. I adore the medieval period in a way I can’t even get into words, but it was difficult commercially. The great news is, a person doesn’t have to sell as many ebooks to make a project worthwhile, so a book like this can find the audience that will appreciate it and nothing is lost. Check back soon…we’re working on getting my third medieval into ebook now. Thanks so much for posting! Thank you, I have been trying to find information roughly this matter for a time and yours is the better I’ve found to date. Nevertheless, think about the conclusion? Are you certain concerning the supply? i prefer using all terrain tires they are much effecient that dedicated tire models, its a tire that is jack of al trades.